Determine the maximum deflection for the beam loaded as shown in Fig. P-644. Find the maximum value of EIδ for the cantilever beam shown in Fig. P-643. For the cantilever beam shown in Fig. P-641, what will cause zero deflection at A? The downward distributed load and an upward concentrated force act on the cantilever beam in Fig. P-639. Find the amount the free end deflects upward or downward if E = 1.5 × 106 psi and I = 60 in4. 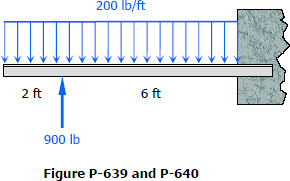 For the cantilever beam shown in Fig. P-638, determine the value of EIδ at the left end. Is this deflection upward or downward?